Borocourt Wood is owned by the Forestry Commission and has full public access except in newly-planted areas. 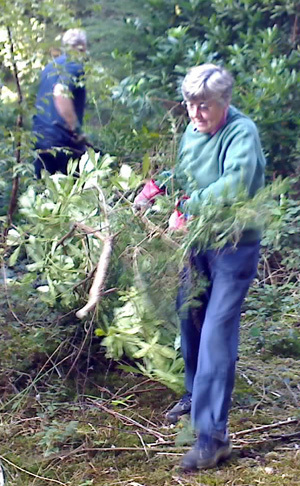 One of our tasks there is to clear invasive rhododendrons by mattocking out the roots, or if that is too difficult to cut them to stump which is then treated with weedkiller. Another task has been to remove 700m of redundant fence around a maturing plantation. The wood has open rides through a mix of trees rich in bird life, and at visits here we have sighted woodcock and heard willow warblers.